Morris Berger's Plantation Inn was located at 3600 E. Broadway on 'the strip' in West Memphis, Arkansas. As we've discussed in the past, the 'PI' provided a place where white patrons could dance to black music, something that was simply not possible in those days without crossing the Mississippi. In the early fifties, the swing stylings of Phineas Newborn's Orchestra gave way to smaller tight-knit combos whose stripped down horn structures laid the foundation of what would come to be known as the 'Memphis Sound'. The bands of Willie Mitchell, Bowlegs Miller and Ben Branch became a proving ground for a generation of up and coming Memphis musicians, and provided a readily available talent pool for the explosion of small record companies and studios that grew up in the wake of Sun and Elvis. 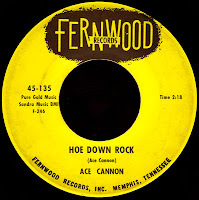 In yet another example of how everything to do with Memphis music is connected one way or another, let's take a look at the Fernwood label. Started up in late 1956 by Jack Clement and Roland 'Slim' Wallace, they recorded in a small studio set up in Slim's garage. 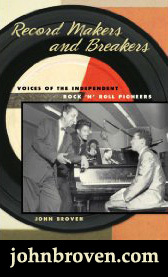 Long recognized as one of the primary incubators of Rockabilly, they produced seminal sides by guys like Thomas Wayne and Travis Wammack. Just as his partner Bill Black had done with Hi, Scotty Moore joined forces with Fernwood after Elvis was drafted in 1958. 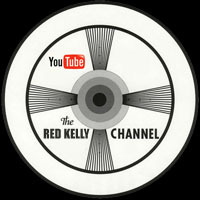 His influence soon paid off, as the label began to have some significant national hits. Like Sun before it, Fernwood also acted as a 'recording service', and would cut a record for anyone who came in off the street. Those records saw limited distribution, and even though some of them were released on Fernwood subsidiaries like Whirl-A-Way and Pure Gold, they were mostly confined to the city limits. 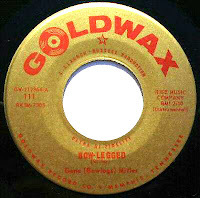 Many of those singles have been collected in a CD called Fernwood Rhythm 'n' Blues From Memphis that contains the first efforts of future Goldwax artists like The Lyrics and Barbara Perry among others. Those early sessions were run by our man Bowlegs, with members of his band providing the back-up, and appear to be his first appearance on vinyl. Another Memphis entrepreneur who would start up his own record company in those heady days was Ruben Cherry. Cherry owned the infamous 'Home of the Blues' record shop on Beale Street, and named the label after his store. He used the Fernwood studio to record many of his releases, which he sold primarily over the counter. Willie Mitchell's first records appeared on Home of the Blues alongside those by Roy Brown and The 5 Royales. 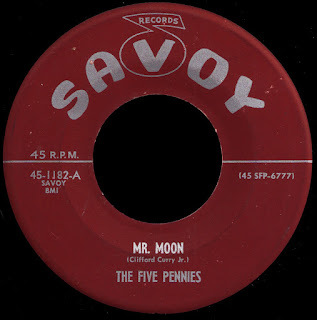 After Cherry sold his masters to Vee-Jay in 1961, One More Time Part One (Vee-Jay 400) became the first single issued under the name 'Bowlegs and his Band'. According to the liner notes of The Goldwax Story, Miller then "cut for Zab, Bee Jay, and Christie before signing a six side deal with Goldwax..." As you may recall, we spoke a couple of weeks ago about how it was The Ovations that first brought Bowlegs to the attention of Claunch and Russell, who used his band to back them up on on their first release Pretty Little Angel (Goldwax 110). 'Gene (Bowlegs) Miller' would have the very next release on the label, the smokin' two-sider Toddlin'/Bow-Legged (Goldwax 111) in late 1964. By 1965, things were really starting to heat up on the soul scene down there in Memphis. Members of Miller's band Marvell Thomas and Andrew Love (who had been with him since he was in tenth grade) held down steady gigs at Stax, as did a kid who played the bass for him before switching over to organ at one of their gigs at the Flamingo Club, Booker T. Jones. Atlantic Records was still very much involved with Stax, and called in Bowlegs to augment the Mar-Key Horns (as they were known at that point) as a second trumpet on Otis Redding's landmark album, the Tom Dowd produced Otis Blue. 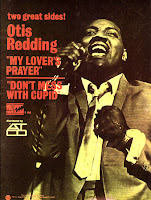 They liked the arrangement so much that they continued to use him, and he appears on everything Otis recorded up until late 1966. 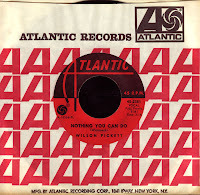 Atlantic would go on to use Miller on the Wilson Pickett and Don Covay material they cut on McLemore Avenue as well, before Jim Stewart threw Jerry Wexler out at the end of 1965. 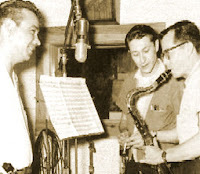 When Wexler made the move to Fame in 1966, he attempted to take Memphis with him, bringing along guys like Chips Moman, Tommy Cogbill and Bowlegs Miller. Miller found a home there, and would go on to become an integral part of the 'Muscle Shoals Horns' at the studio. 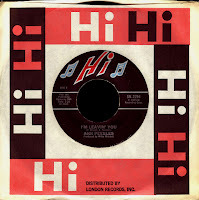 Today's cool selection (the flip of the cookin' Here It Is Now) hails from that period at Fame, with Rick Hall listed as a co-writer as is Andrew Love, who's apparently blowing that funky horn. That's Bowlegs on the hilarious vocals which, I think, illustrate the sense of humor that made him a favorite of everyone who knew him. "...the sound of that drum sure blends nice with this rum" - I hear that! With his years of experience, Miller was instrumental in coming up with those incredible 'head arrangements' of the horns on so many Fame recorded sides. A talent that, I'm sure, kept him a favorite of Rick Hall as well, as he didn't have to pay a separate arranger. 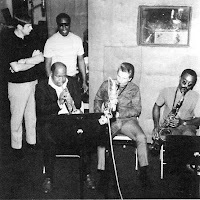 As Atlantic's presence at the studio diminished after the Aretha Franklin incident, Bowlegs was there as Chess moved in, working on monumental records by Irma Thomas, Laura Lee and, of course, Etta James. Although the label credits read 'Arranged and Produced by Rick Hall & Staff', you can bet the store that Bowlegs had something to do with those amazing horn lines on songs like Tell Mama and Dirty Man... just top shelf stuff, kids. Bowlegs continued to play with his band in Memphis, and became a member of the horn section at Hi along with James Mitchell, Willie's brother. 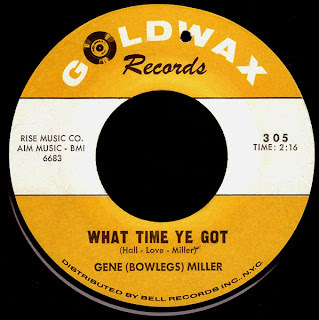 Hi would release three singles by 'Gene Miller' (including 1969's way cool Frankenstein Walk), but he is remembered primarily as the man who 'discovered' Ann Peebles when she got up on stage to sing with his band at the Club Rosewood one night, and he brought her to Royal to meet Willie the next day. 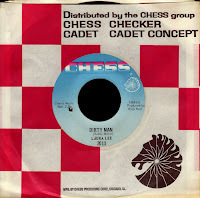 Other labels that wanted a piece of that Memphis Magic began sending their artists to Royal as well, as was the case with Decca and Danny White. 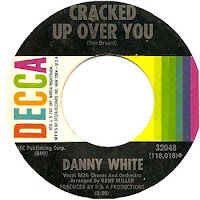 This circa 1966 single was a Gene Miller arrangement of a Don Bryant song... a Hi product all the way, with Bowlegs being given an arranging credit on the label so he could get a share of the 'mechanicals' from the big company. The label also says it was was produced by 'D & A Productions', anybody have any clue who that might have been? 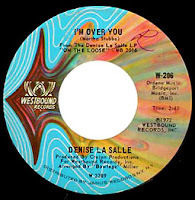 In 1971, Detroit's Westbound label sent a young singer named Denise LaSalle down to Willie at Royal Studio, and he came up with her biggest hit, #1 R&B smash, Trapped By A Thing Called Love. 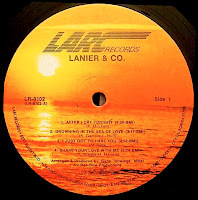 On her next trip to Memphis in 1972, Bowlegs was again given label credit for arranging the follow-up album On The Loose, which included the single Man Sized Job, another R&B blockbuster that spent over three months on the R&B charts, climbing to #4. 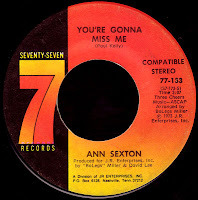 In 1971, John Richbourg had leased a single by a South Carolina singer named Ann Sexton from a small label called Impel for release on his new Seventy Seven imprint. He would send her to Memphis (along with David Lee, who was apparently the owner of Impel and Sexton's manager) to record with Miller, and the resulting single is one of my (and O Dub's) favorite records ever. As far as I can tell, You're Gonna Miss Me (now up on The A Side) is the first record where 'BoLegs' is given credit as the producer. It would crack the R&B top fifty in the fall of 1973. 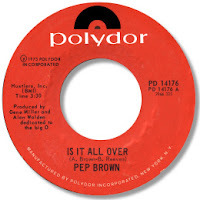 1973 also saw the release of another soul treasure, Pep Brown's wonderful It's All Over, which was 'Produced by Gene Miller and Alan Walden dedicated to the Big O'... the big O being of course Otis Redding. A truly great record that, along with its equally good B side, delivers "the throwback sound that set Pep’s anguished tones in a perfect context to deliver a double sided helping of deep soul heaven," so says Sir Shambling. 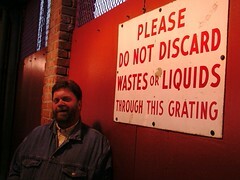 I heartily agree. 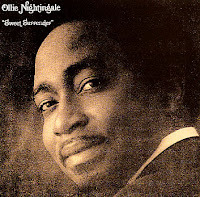 That same year, Gene would produce the excellent Sweet Surrender, by Ollie Nightingale. One of the most under-appreciated albums in soul history, it was released on the MGM subsidiary label Pride, and sank like a stone (it's recently been re-issued on a Japanese P-Vine CD). The nature of things in the record business was changing at this point, as the whole Disco era was coming on fast. One of the few holdouts through all of that was Hi Records, who continued to turn out hit records by folks like Al Green and Ann Peebles, records that I'm sure continued to have contributions from Bowlegs in the horn section. Gene 'Bowlegs' Miller passed away in Memphis on Christmas Day 1987. He was 54 years old. He never got anywhere near the recognition he deserved. "Papa Killed A Chicken" by Willie Toliver is on that out of print Memphis 70 disc you referred me to and is also on the Select-O-Hit comp I have. It's another great , greasy jam... maybe I'll post these chestnuts soon fer yer perusal since finding them is hard for most folks these days.